Has baking season started at your house? I can feel it ramping up at my house. I don't do a lot of baking of sweet things the rest of the year, but from now through the end of the year, I will be getting my bake on. 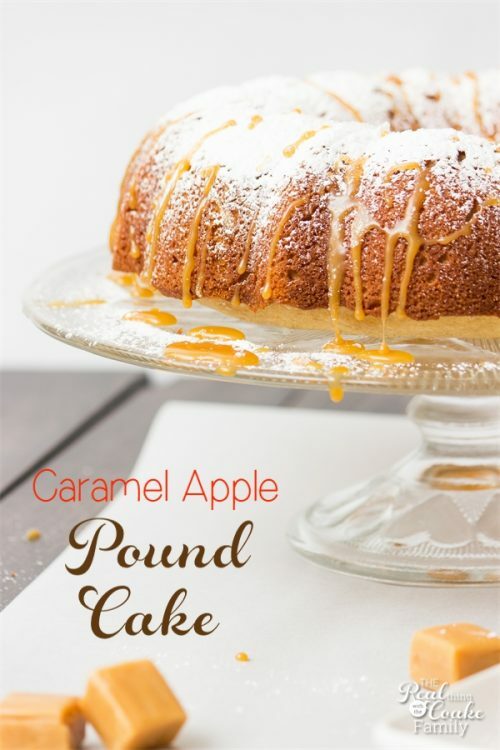 🙂 I came up with this super delicious recipe for a caramel apple pound cake and I thought you would enjoy it as well. 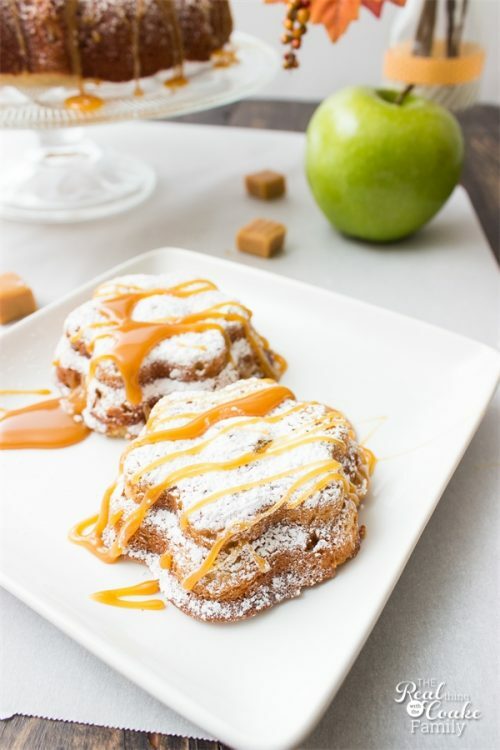 It is a fun fall dessert with a surprising ingredient. I know that pound cakes are normally made loaf style, but I decided to make mine fancy for fun. I doubled my recipe and made one in a bundt pan and the other into little mini cakes. There is just something fun about a fancy cake(like the Chocolate Angel Food Cake I made)…I know kind of dorky, but totally true for me. Remember when I said the cake had a surprising ingredient? I added some Yoplait (who also sponsored this post) yogurt. I used Yoplait Greek 100 Caramel Apple which I picked up at Walmart. 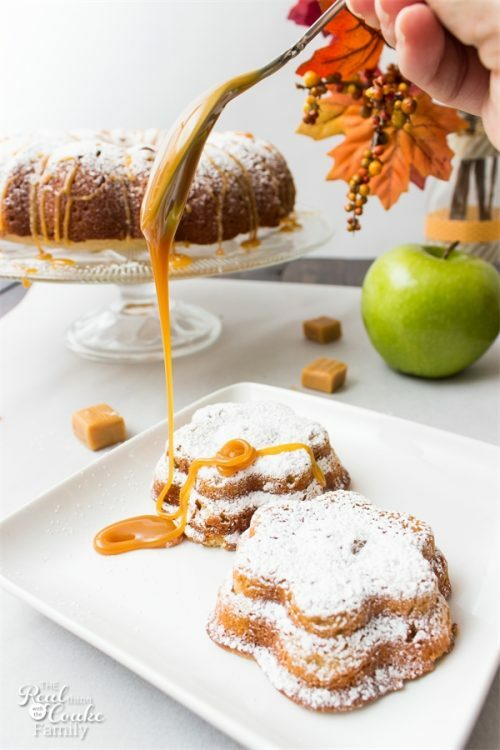 It was a super easy way to infuse the cake with the caramel apple flavor. I'm all for delicious fall desserts, but I don't always have the time to make a cake like this fully from scratch. 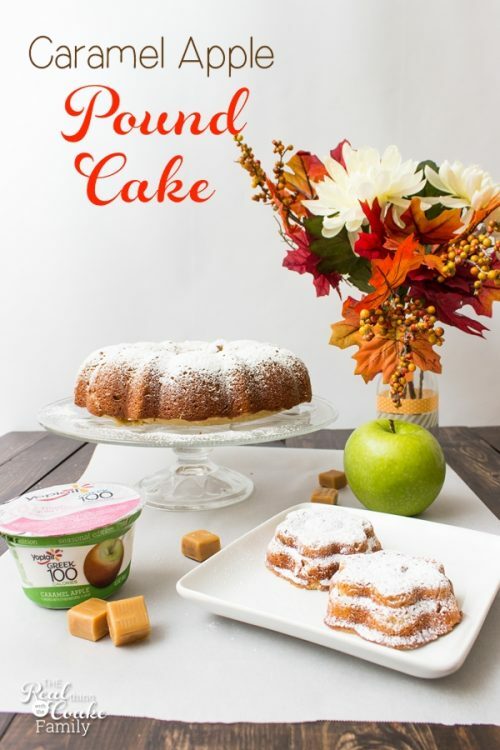 Opening up a container of yogurt and adding it to my cake mix makes it so simple to add the caramel apple flavor. Yay! 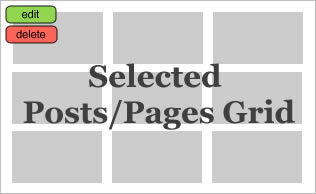 I have the full printable recipe for you at the bottom of the post. Once you have mixed up and baked your cake, let it cool. 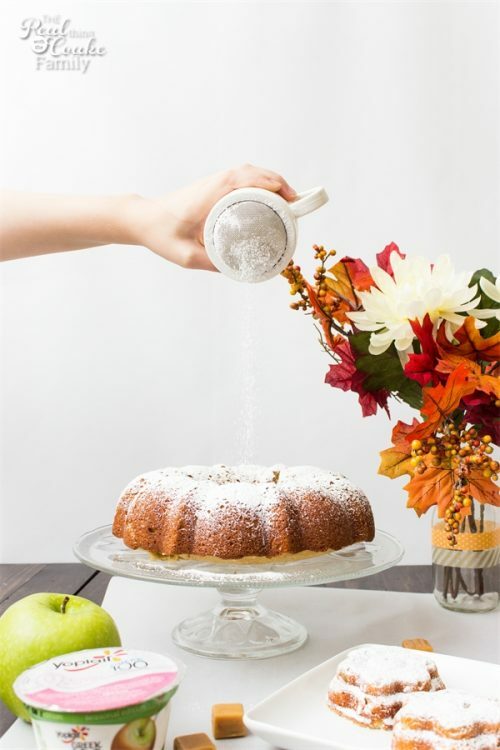 To add some additional prettiness and flavor, add a dusting of confectioners sugar to the cake. Then top with caramel sauce. You can make your own or you can buy some at the store, which is what I did. 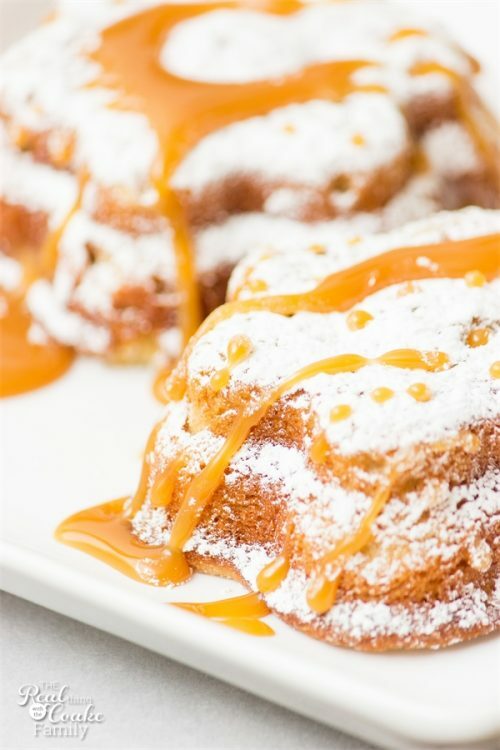 I learned that I'm not very good at photographing myself drizzling a cake with caramel….yeah, a skill everyone needs to have and I'm missing it. Lol! My big blob of caramel not even on the cake aside, the caramel on top adds some more delicious fall flavor to the cake and makes it looks so pretty as well. It is a dense cake since it is a pound cake. If you want it just a touch lighter, try using all-purpose flour versus the white whole wheat flour I used and have referenced in the recipe. It is a lighter flour than the white whole wheat flour. I recently took a photography class and have been having fun trying out my new techniques…I had fun photographing these cakes. Yep, dorky side showing again. I love some of the pics I got, though, so you get to see some extra pictures of this delicious fall cake. I was amazed by how adding one container of yogurt, I really could add all that flavor to the cake. Made it so easy to make a special flavor cake. 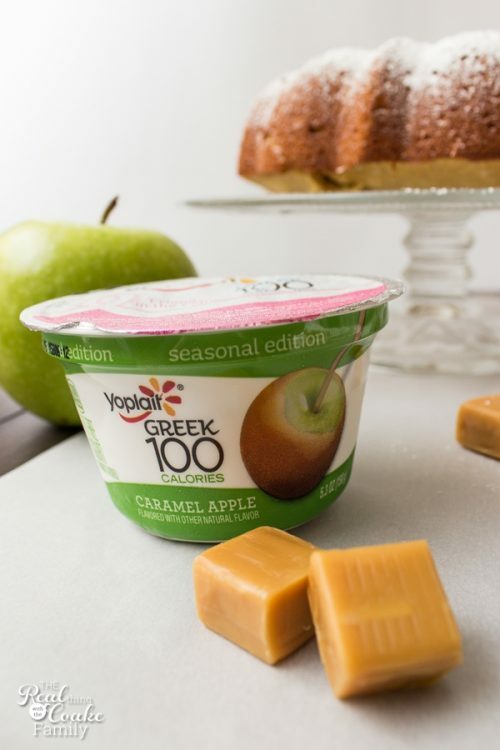 There are other seasonal varieties of Yoplait, so you could try the Yoplait Greek 100 Whips! Pumpkin Cheesecake (which is what Pumpkin really wanted me to make) or one of the other great fall varieties. They should work just the same in this recipe. Just make sure you are using the correct number of ounces of yogurt and have fun!